It was the star turn of Mobile World Congress with a folding phone that was 5G ready. But on this week's Tech Tent we ask should the mobile industry trust Huawei? When I first attended the giant Barcelona mobile gathering more than a decade ago, it was the likes of Nokia, Samsung and even Microsoft, with its Windows phones, which made the headlines. Huawei was an obscure Chinese telecoms equipment maker that occupied a large shed on the showground but struggled to generate much interest from the media. This year the company's press conference on Sunday was the hottest ticket, with swarms of journalists queuing up for an hour to get in. At the heart of the loud and slightly clunky presentation was the Huawei Mate X, a phone with a foldable screen that the presenter suggested was bigger and better in every way than the Samsung Galaxy Fold, unveiled a few days earlier. Despite the fact that at $2,600 (£1,960) it was also even more expensive, most analysts agreed that it trumped the Samsung device. I even managed to get my hands on it the following day though the Huawei executive who produced it out of an inside jacket pocket seemed terrified that I might fold it too far and break it. But if Huawei was rather more open about its new device than Samsung, there was one issue that was firmly off the agenda, The company did not want to talk about the allegations from the United States that it poses a security threat to the new 5G networks. 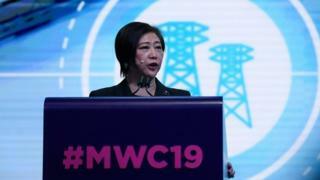 US government officials were in Barcelona to press home their message that Huawei owes its allegiance to the Chinese Communist Party and should not be trusted by the mobile operators to provide secure equipment for their new networks. The Europeans were keen to be seen as sharing some of those concerns. Security consultant David Rogers tells Tech Tent the operators do realise that they may have become over-reliant on cheap Huawei equipment: "The mobile networks have paid bottom dollar in a lot of cases for certain network equipment and that equipment might not be the same quality as other providers and now they're reaping what they've sown." But the operators also appear to share Huawei's view that the United States has failed to provide evidence of any wrongdoing in the form of backdoors in its equipment. The consensus is that all providers, whether from China or elsewhere, need to be subjected to greater scrutiny as 5G networks are rolled out and become embedded in vital infrastructure. With 5G demos everywhere across the vast halls of Mobile World Congress, it was apparent how central this technology is to this industry's ambitions and how important security will be. We saw how in Toronto 5G sensors have been installed across the water system to identify water pressure and improve efficiency by spotting any leaks. A team from the UK's University of Surrey showed off a 5G-enabled McLaren sports car which could receive live information about other cars and hazards from sensors mounted by the roads. Image caption 5G could be vital for smart city services but can the operators make money? In both cases, you would want to be certain that the networks and the devices connected to them could not be hacked. Along with all these security concerns, the operators and manufacturers face another nagging question - can they actually make money from 5G? As we emerged from the event where the Chinese firm Xiaomi had unveiled a 5G handset for $679, I ran into the leading mobile analyst Ben Wood of CCS Insight. He described that price as "eye-popping" - and he meant low not high. With the Chinese firm offering a state-of-the-art 5G handset at a price way below Samsung and Apple's 4G flagships, Ben reckons middle market manufacturers like Sony and LG will struggle to make any kind of margin. 5G looks certain to bring another wave of disruption to the mobile industry. And whatever the issues of trust and security, Chinese firms like Xiaomi and Huawei look likely to prosper.